Discussion in 'Bay Tech Clinic' started by Deluxe, May 11, 2009. Still haven't scanned the pages -VERY sorry, but will do so over the weekend when I get a minute to breathe without a 3 year old dropping Lego blocks or cars on the computer!! It's unlikely that all 25 pages would be published in Transporter Talk, but it might be useful to post them all on the VWT2OC website, when it finally gets sorted out properly. In the meantime, if you post them all on I suitable site such as photobucket, on which they can be viewed, then Carol Jarvis and I can discuss, what subset of pages, might be most appropriate for the A5-page format (i.e. 210 mm x 149 mm) of Transporter Talk magazine. man I'm envious. Nothing worse than a gutted LCA. I have no idea what the interior used to look like. Plus I hate it being empty. Working my rear off to resurrect it but having no inside is a big downer. Anyone have a spare? I think I could just about claim the title for cheapest engine conversion, and most creative uses for off the shelf parts, but I have no idea how to build a useful interior. 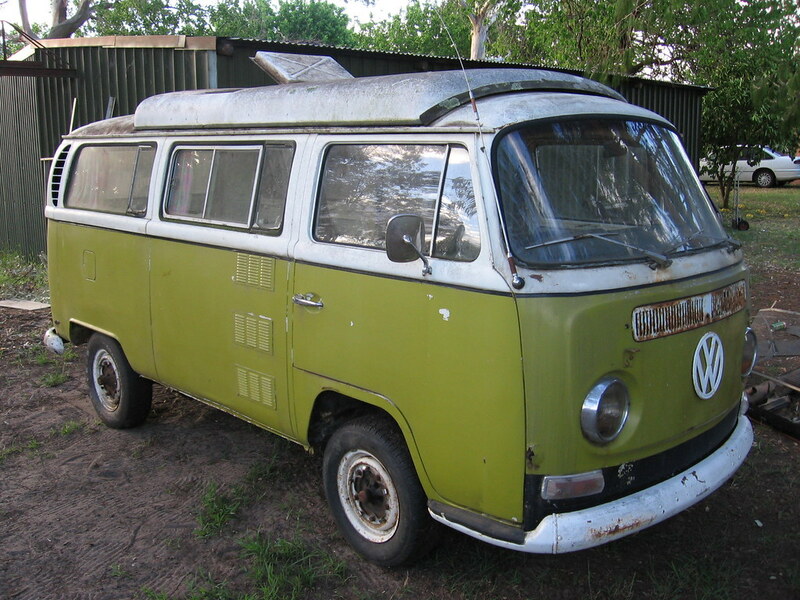 At least with a Westfalia or a Dormobile you know what was pulled out! How is the page scanning of the 25-page owners' manual coming along!?! 1969 model with Sunliner conversion - unfortunately I junked the interior (other than the rock & roll seat) before I realised it should have been preserved but it was in pretty poor shape. The bus has a paintbrush paintjob and the only reason I know it is a Sunliner is because there's a sticker visible under the paint saying so! Thats is interesting how far forward the Top sits. and how high it is. My 76 camper (new world order?) 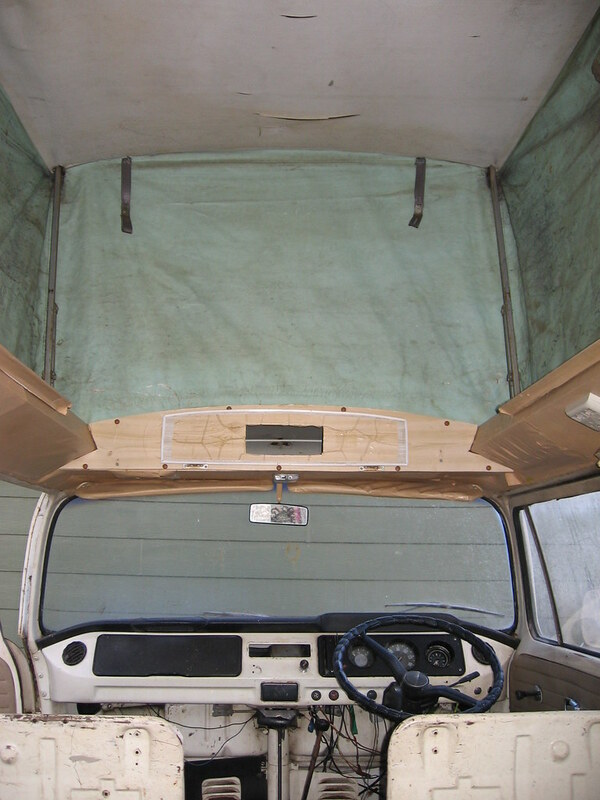 pop top doesnt start till behind the front seats and doesnt appear to rise that high. Mine came gutted so I have no idea what was in it apart from the location ofthe gas cylinder and stove. Thats exacatly what i have but but a bit further back and i have no documentation. do you have any history of where it came from? Another version to add - Noosa Converstions. As the name suggests, they were based in Noosa Qld. They were in business around 1977-8. The fittout was similar in style to trakka and Sopru of the time but these guys used fibreglass cupboards and panelling. 78 2 L Manual - Noosa Converstions - "Macca"
I realise this is an old thread - but thanks to Nigel - you've just solved the mystery of why the windows in our 73 are smaller than normal - they were cut by Land Cruisers - it's been bugging me for 2 years! Reviving an old thread... Read a bit in here about Shiralee conversions. Not many people seem to have heard/seen them. I've recently acquired one if anyone is interested I can post up some pics! Definantly post some pics it's good to see the different variations. Trakka Conversion...note how low the pop top....I removed the interior except for the rock and roll bed a few years ago. Another point of difference is that the canvas....is not canvas but a vinyl type material.